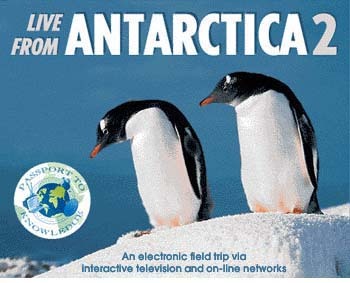 LIVE FROM ANTARCTICA 2 set sail for Palmer Station in Winter 1996, but this site continues to provide many timeless insights into life under, on, and high above the Southern Ocean. And please check back soon for news of new Antarctic programming! "Researcher Q&A is no longer inter/active." The PASSPORT TO ANTARCTICA website (which will incorporate the LIVE FROM ANTARCTICA sites and resources) is being updated and redesigned to support educator and student use during the 2001-2002 school year. Please use this site to sample Antarctic information already available, and visit the PASSPORT TO THE RAINFOREST site to see sample design and navigation tools.